A good story lives on forever and when it comes to wooing Indians, nothing can beat a storyline with ‘emotions and love for family’. A story around family relationships always works wonders and in the social media driven age, it is these stories that drive the likes, shares and comments. British Airways (BA) is one airline that’s been constantly appealing to our emotional side in its communication campaigns, with ‘family’ playing a key role in its ad films targeting India. The country also happens to be the second largest market for British Airways outside the United States and the United Kingdom. This year, the airline once again embarked on an emotional route via its ad film, “Fueled by Love” claiming to be inspired by the true story of a BA crew. Created by SapientNitro India and directed by Neeraj Ghaywan of Masaan fame, the 6.30 minute film has all the makings of a good story: love, friendship, care and bonding, attributes BA would like to be associated with. “Fueled by Love” is the story of Helena Flynn, a British Airways flight attendant and an old Indian woman who’s son is in London. On board the flight from Heathrow to Hyderabad, Helena is seen missing her family just as much as the old woman is missing her son. Both form a beautiful bond throughout the flight, leading to an invitation by the the old woman: “You have to come to my house…no you have to,” she makes a humble yet insistent request to Helena. What follows is Helena’s memorable day with the old woman and her family and a good portion of Indian culture and hospitality. You cannot help shed a tear when Helena is handed home-cooked food for her return journey, and a well thought through embroidered handkerchief by the old woman, her new friend. Helena can’t help but fall in love with India. The super at the end goes: ‘Loving India back since 1924’. #FuelledByLove is also being brought alive with real crew stories on social media. The British Airways Facebook and Twitter pages have been sharing India stories by BA crew. There’s the story of Jayne Deasy, Cabin Services Director, Worldwide Fleet on her first visit to India. In 2013, the airline had launched ‘Visit Mum’ campaign, where an Indian mother talks about how much she misses her son in America, who has been living in NYC ever since he was 17. During the course of the film, she cooks her son’s favourite childhood meal ‘Bhindi (okra) parantha‘ for BA to fly to him in New York, but ends up being surprised by team BA who bring her son home instead. The film to promote the route network between India and the US, received an overwhelming response on social media. The video has over 1.5 million views on YouTube. BA flew the dramatic route again in 2014 with its ‘Go further to get closer’ campaign. This time the focus was on a real life married couple – Sumeet and Chetna. A 5-minute film portrayed the beautiful love story of a married Indian couple of 3 years who despite loving each other, never really have found the time to know each other. Work pressures coupled with the responsibilities of living with parents and taking care of them, had left them with little time for each other. BA surprises them with an all-expense paid trip to London. The video has garnered over 2.6 million views on YouTube. 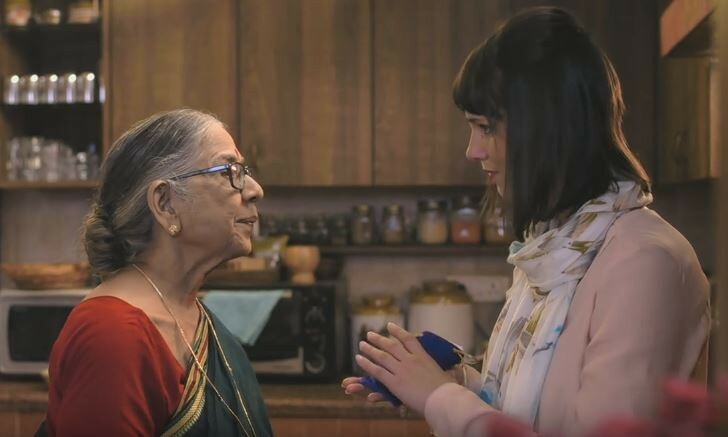 British Airways’ love for India is always reflected in its ad films, in fact, celebrating Indian family bonds, food and culture is almost intrinsic in BA’s ads. ‘Fuelled by love’ may not have real characters like ‘Visit Mum’ and ‘Go further to get closer’ but the ‘inspired by a true story’ line does the trick. A viewer cannot help but watch 6.30 minutes of an emotional drama unfolding the real reason behind BA’s love for India since 1924 – the easy friendship bonds we make and the hospitality we extend to guests. A 23-year-old flight attendant and a 70+ old mother forming a strong bond aboard a flight, is indeed a sweet tale of friendship! The campaign gets a boost with the addition of crew stories. Once again, we are reminded of the power of storytelling in the digital age, and the impact it can create among the always-on social media savvy audiences.